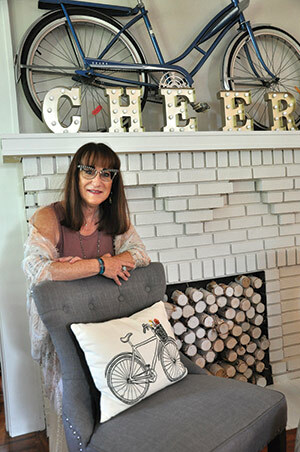 Robin Roth-Murphy highlights her living room mantel with her favorite found object: a bicycle from the 1950s. Elton John has one of the ‘Heeling Soles’ artistic shoes created by Robin Roth-Murphy in his Woodside Estate in England! 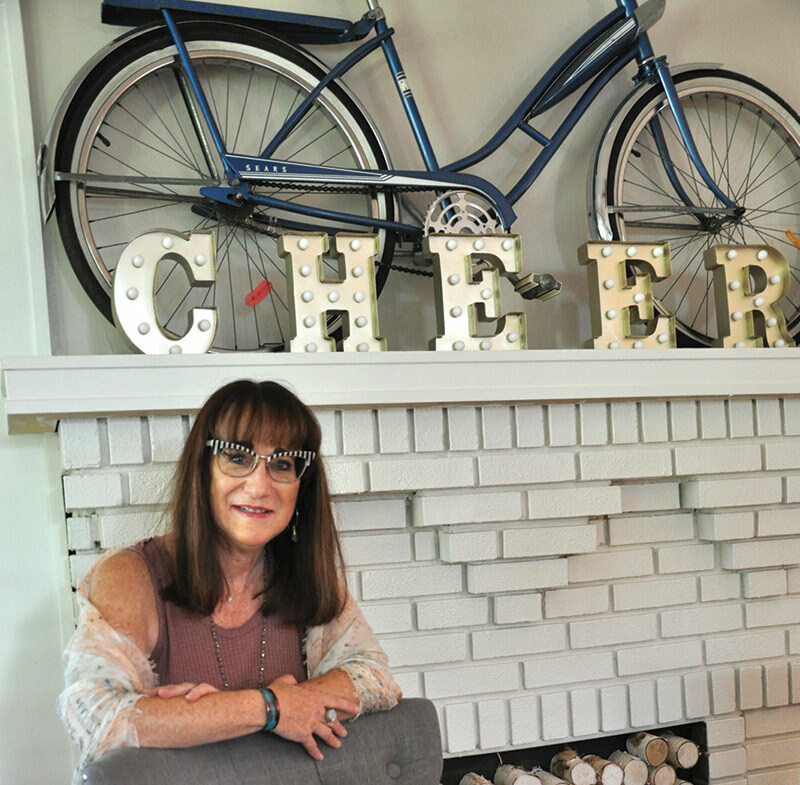 Now that is quite a story, just one of many, about Robin and her specialized art that is created from found objects (mementos, keepsakes, souvenirs, relics, or “stuff” as Robin puts it). Old Northeast residents may know her better as The Alley Recycle Artist or The Little Free Library Lady. Whatever she is called or does, it just provides more stories to tell. 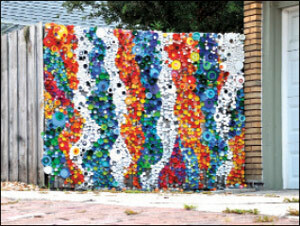 This spring, Robin, a mixed-media artist, decided to decorate part of her alley wall with recyclables: plastic bottle caps! She needed a lot of them in order to finish the project – a mural really – in a reasonable amount of time. So she posted a sign on the fence above a bucket saying, “Please leave plastic lids here.” She also posted a request for more caps on the Nextdoor neighborhood online network. Robin used grandmother’s old dress fabric to cover the shade of a standing lamp from Target. And she used tons of costume jewelry to adorn the entire column, a perfect example of Robin’s unexpected ideas for design. Now, let’s talk about Robin’s Little Free Library box, designed as only Robin would do, covered with relics. Robin embellished an old cabinet and collaged copies of books on it, adding playful figures on top. (They are actually her children’s discarded Happy Meals figures from the ’80s.) It is situated in plain view in the front yard with a ‘reading’ bench nearby. It is well known throughout the neighborhood, even attracting a visiting Japanese exchange student and her host family recently. So, how does Robin’s idea of Heeling Soles artwork connect to Sir Elton John? Robin was one of a few select artists commissioned to modify recycled shoes as art pieces to decorate windows for Stuart Weitzman, Inc., a high-end footwear retailer in New York City. She used her ‘Girls-at-Play’ style to create one-of-a kind display pieces. The shoes were also part of a traveling display at Weitzman retail operations nationwide. The recycled, reconstructed single pumps are wildly creative, decorative, and high-style, embellished with vivid silk, tapestry, glass beads, and vintage buttons and gems. According to Robin, each shoe, as it is created, takes on a personality of its own. Sounds like Elton John style for sure! In Robin’s ‘magical garden,’a metal watering can hangs from a wrought iron stand, with clear crystal ‘water’” drops spilling out – a perfect art sculpture and a perfect view from the repurposed dining room table, below. At the time, Robin lived in the Buckhead section of Atlanta. She knew from a friend that Elton John had a penthouse in a neighboring high rise. Everyone said that one of the shoes in her collection was in the style of Elton John. So, on a whim, she put that shoe in one of her vintage hatboxes and delivered it to his building. The next day she received a handwritten note from him thanking her and saying he was sending it to England and “putting it in his Oxford Collection.” Oh my! Yes, Robin is well known for her Girls at Play Timekeeper dolls and Frazzle Dazzle dolls. She doesn’t plan the look of each doll, but allows her intuition free reign. Bits and pieces of wood, often vintage, are cut to size, and exposed areas are painted, stained, or wrapped in fiber, according to Robin. The creation of each doll involves machine- and hand-stitching, woodworking, and painting. Both kinds of dolls are made from vintage fabrics, trims, and recycled materials. A leaf from Robin’s childhood dining room table (painted years ago in Robin’s funky design) has been repurposed yet again – with help by ONE resident David Calvin – into a rolling tray and is now an oblong ‘Lazy Susan.’ Robin’s Whimsical Garden can be viewed out the dining room window. Her house itself is Robin’s studio. Every step through each room becomes slower and slower as one gazes at unique objects d’art on a wall, the floor, or in a corner. The bicycle standing on the living room mantel makes quite a statement. That’s because Robin loves its story of devotion. Robin found it recently at an antique store in St. Petersburg. This Sears bike was ridden for years by its original owner, a woman in her 70s who grew up in St. Petersburg. The magical view out the dining room window embodies how Robin places art in all of her world. 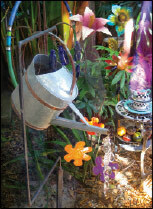 Known as Robin’s Whimsical Garden, found objects and relics, metal flowers, and small iron tables – all become really magical when lit up at night. This is a perfect garden – no weeding, no fertilizer, no watering. When talking to Robin, one finds her very open and highly descriptive, so telling her story is easy. How did a girl from Louisville who loved living in Atlanta end up here in St. Petersburg? Robin the ‘Alley Recycle Artist’ decided to decorate part of her alley wall with recyclables: plastic bottle caps collected from neighbors. Atlanta was the meeting place for Robin and Mike. They were both married before and between them have three boys. Robin and Mike love to tell the story of that auspicious meeting. According to Robin, they both had blind dates at an upscale restaurant and had arrived early. As they waited, Mike walked up to Robin to talk. She could tell he was nervous as he asked her for a future date. “I gave him the once over, noting his plain blue suit, and told him he was too conservative for me. He responded with, ‘Are you always this judgmental?’” Before they parted for their blind dates, he gave Robin his card. She did call him of course, and they celebrated their 19th wedding anniversary in July! 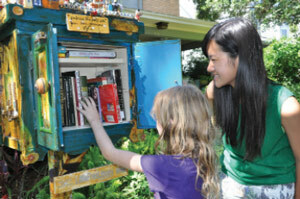 A Japanese exchange student is introduced to Robin’s uniquely decorated Little Free Library Box by a neighbor child. But, what about Robin the artist, what is her story? “My intention 11 years ago was to continue creating as a business once I got situated in Florida, but I never could get myself motivated until recently. The timing is right to reinvent myself as a mixed-media artist.” After a hiatus, she has evolved into sculptured mixed media; jointed dolls are gone and sculptures now have more grown-up faces. 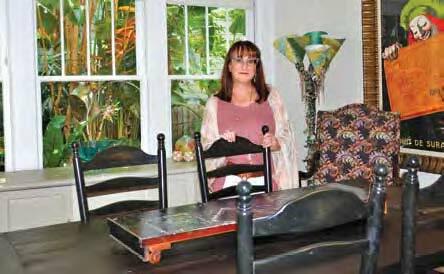 She has pursued other careers, but always comes back to art. “Creating with my hands makes me feel most alive. I lose myself in my artwork and I derive great pleasure in sharing it with others,” she declares. After studying at the Louisville School of Art and the Atlanta School of Art, she exhibited in a myriad of juried American Craft Council shows. Her work has appeared on the cover of several publications and she has contributed to many charitable causes. 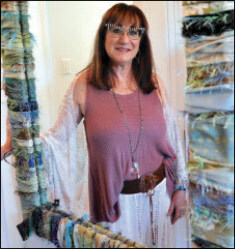 “It was my mother’s homespun artistry displayed in our house on the walls and cupboards that inspired me to pursue a career as an artist,” recalls Robin. But, it was her grandfather’s influence on her that was most profound. It “both haunted and enchanted me,” she says. Her grandfather, Nahum Tschacbasov, was a world-renowned Russian-born, Paris-educated artist whose paintings and poetry were steeped in abstract surrealism. “A small art school suited me best,” muses Robin. “I am mostly self-taught,” she explains, adding, “My love of art is in-born. I was always into stuff – I created stuff! 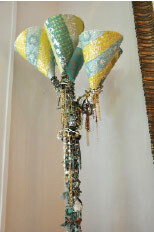 Even as a teen I collected found objects.” She loves texture and textiles. Robin remembers being fascinated with things found on the ground like scraps of telephone wire, broken pieces of pottery, or vintage dishes. When her boys were younger, they would come home from school and look for her in her garage studio and show her what they had found during the day.